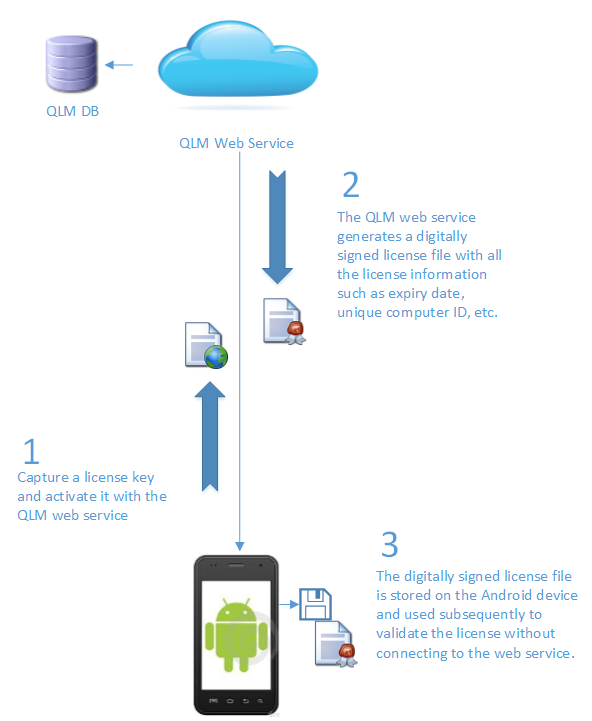 QLM can protect Android apps with license keys with the same features available when protecting Windows applications. To copy protect an Android app, you generate an Activation Key from the QLM Application, via an API call or through our integration with leading ecommerce providers. The activation key specifies the expiry date of the license as well which features should be enabled by this license. The Android App user enters the Activation Key in your Android App and activates it. The diagram on the left displays the data flow between your Android app and the QLM web service. To get started and add licensing support to your Android app, download QLM and take a look at the Android sample program located in the QLM Enterprise samples folder. For more details about the features of QLM, click here.